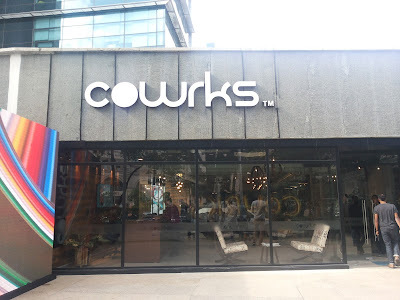 CoWrks, a Bengaluru headquartered co-working community venture has opened its doors to their second co-working facility on Old Madras Road (OMR) at RMZ Infinity. Some of the major companies taken workspace includes: Boeing India R&D, GE Wind Power India, Style Lumia among others have taken space in the private studios. An ode to the technological and entrepreneurship spirit of Bengaluru, the facility boasts of a large format offering of 400 desks across 30000 square feet of space. An estimated 1100 people making up a homogenous mix of professionals from small scale enterprises, startups to a pool of freelancers, independent professionals & entrepreneurs and Fortune 500 companies are expected to move in within the next month. The concept of “Coworking” is a style of work that involves a shared working environment, often an office, and independent activity. Unlike in a typical office environment, those coworking are usually not employed by the same organization. Typically it is attractive to work-at-home professionals, independent contractors, or people who travel frequently who end up working in relative isolation. This latest phase of its market expansion comes hot on the heels of the tremendous success witnessed at its first facility at RMZ Ecoworld in August earlier this year which is already at full capacity. CoWrks is now focused on opening 10 facilities, across 4 metros in the next 6 months as part of a growth strategy encompassing both, entering key markets, and member growth. The two facilities combined, now offer 1.9 lakh square feet of space including 3200 desks designed to stimulate a work culture that dwells on collaboration between communities of like-minded individuals.